The Ladies' Gallery should be an area where ladies can relax, have some refreshment, and view the proceedings. It is purposefully set so that there is an excellent view of the field and all types of combat (field, melee, barrier, etc.). There should be easy access for the combatants to approach the gallery, should their presence be required. This interaction between combatants and the gallery is encouraged! Royalty will normally be set in the center of the gallery, and I recommend that only one pavilion or attached pavilions be used for the gallery, so that All the ladies might hear and see what events unfold, rather than having the field surrounded by pavilions, but the Ladies too far apart to enjoy al that may pass. Conversation in the Gallery could include the events of the tourney and medieval topics, perhaps the telling of tales and reading of poetry. If a minstrel is playing softly for the ladies, it is good and right. While modern references tend to detract from the courtly atmosphere, all speech given in a courtly manner is acceptable. All lords should beg the leave of the gallery when approaching, just as they should when approaching the lion's den, or any of royal status. All of the combatant's consorts, whether they are a Venant (visitor/challenger) or a Tenant (defender/host) should all be in the same gallery. If there is more room in the gallery, all ladies are welcome there, whether they are a consort or no. The Herald King of Arms, or Marshall, or Herald, whatsoever he may be called, holds a special position. He/she has a duty to the gallery and also to the combatants. They are to keep the flow of the tourney going, watch out for safety issues, and they are the liason between the gallery and the combatants, and the gallery and the host whenever necessary. They are more than willing to explain the rules or some specifics on combat that the ladies have questions about. They defer to the hosting Company, knight, or individual for decisions regarding conduct of the tourney. They approach the gallery with impunity, for their responsibilities require them to have free reign of the field at all times. Great deeds are done on the field of honour, and every nuance that you can understand about the combat arts will help you in knowing, appreciating and supporting your consort. Just so if your consort understands your role and challenges will he be better able to support and appreciate you. Sometimes ladies are asked to choose weapons or fighting style, or to match up opponents. To make this an informed decision, know your consorts preferences and fighting styles, speak with him if allowed. You will enjoy it all the more! Also the combatantsor consorts may be speaking on chivalric topics or upon the views of our ancestors on these topics. His education and reading in these areas will show, as will yours. Some may have little book learning on these subjects, but rather take an intuitive approach. This also has great value and can be appreciated by a gentle lady. If a combatant arrives prepared to read a poem to the gallery, or sing a song, in my mind he is well armed and armored for that potential situation. Even if you know little of these things, and have no interest in fighting, it is only courteous to pay attention to the combat when your consort is upon the field. While in many tournaments it is not uncommon for a combatant's consort to be absent from the field, inattention here is a different matter. He represents you, as he represents himself, his household, and his kingdom. He may need help preparing his array, and may not even know he needs help, or how to ask for it. Some lords take great pride in their gear and it shows. Others have not yet learned this art. Communicate with your consort, so that you might have a combined intent. Do you desire him to bear a certain favor or token? What heraldry can be displayed? Here coordination may be the key to your success. Heraldic display in every form is appropriate. Sometimes the consort and combatant first meet just prior to the tourney beginning. This can be awkward, but also wonderful, as new freinds are made and the magic of the day is meant to be shared. Every combatant should bear a matching surcoat, shield and banner. While these are not requirements, they are the basic elements of the tournier's heraldry. You represent your consort, you provide the inspiration that he needs to shine. Strength in combat has many sources, and your inspiration is not the least. Your heraldry, your banner, shows your pride and proclaims your presence. It is not unknown for a combatant to fight in his consort's heraldry. Fantastic! He is not the enemy, nor is his consort the enemy. She has the same responsibility as you: she looks out for his honor, as he carries hers. All combatants are gentle knights on the field of a chivalric tournament, though they may not be belted Knights. Losing well is at least as important as winning well here. There is a great attempt made to ensure the combat is challenging and fair. 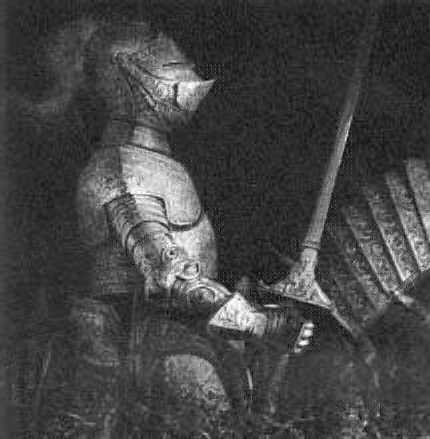 Most tourniers find that they return to the simple joy of combat when fighting in a chivalric tournament, and may take risks they would not otherwise. In addition, some combatants have never fought at the barrier, and there might be other fighting styles or situations that they are unprepared for. This makes the pas d'armes unpredictable! Your consort will be sizing up his opponents abilities and assessing his strategy for the bout. The more you understand about his opponent's fighting style, prowess, armor type, favorite weapon, etc., the more you will know the mind of your consort. I have heard of a time when two consorts called a halt to the final round of a tourney. Their lords had been fighting for some time and seemed equally matched. Impressive displays of prowess and skill were shown by both combatants. The ladies, who were standing together at the side of the field, decided to call a halt and declare a tie, so much were they impressed with their opponents. The most important duty a consort has is to guard against the combatant's greatest enemy: Vainglory. This is the vilest form of Pride and can come upon the best of gentles at the worst of times. Certainly a consort should look out for Fair Play and Anger, also, for the consort views the combat from a different perspective. We all know that sometimes what the combatants experience is not what the crowd sees. A consort should be willing to safeguard the honor of the combatant, whose honor is tied to hers. This may mean as much as calling a hold, or as little as praising his opponent for a point of chivalry, or simply getting clarification from the Herald King of Arms over a rule of combat, or even just watching the combat. Ladies, do not be shy. Your attentiveness to this will not be missed! Make sure the ladies of the gallery understand the conduct and spirit of the tourney. Attend to all the consorts and assist the Herald King of Arms. Keep everyone comfortable, dry, and free of want. Be flexible. Call upon the Herald King of arms if there is any confusion or concern about the conduct of the tourney or any combat. Be sure to understand the rules of the pas, but abide by the spirit no matter what. The spirit of the pas is what rules the day, not the rulebook. Ensure your consort understands the rules, and is aware of the many changes that can occur. You are the watchbird of etiquette for him. Things to be aware of: who is the Herald King of Arms? What will your tasks be, if any? What changes have been made to the conduct of the tourney? What will your consort be required to do? Perhaps you or your consort has a special presentation, when can that be done? Though a lord may not be your consort, still should he treat you with the utmost respect. Regardless of SCA persona, courtly behavior is expected, and in the context of the list insult will NOT be tolerated. Issue challenge or rebuke as necessary! Call upon the ladies gallery or Herald King of Arms if necessary. If a lord pokes fun at you, or jests, this may be a fine opportunity for a challenge. Have fun with this! Also, it is fine to call upon any lord to attend you; as a member of the Gallery, your will & desires may be backed by the will of the Gallery, though it can be fickle. It is certainly acceptable to ask a lord about a previous fight, or to read you a passage of poetry, or other such dainties. A Lady's words are very powerful, and to gain some recognition from a Lady is all a Lord can hope for. But a disparaging word is also very powerful and can crush a man's will to do good deeds. A Lady must be very, very careful when wielding the dual-edged sword of Inspiration and Rejection. Be sparing with your criticism & free with your compliments. The shift of focus from victory to virtue in this special tournament makes many Lords uncomfortable, especially when they are required to speak their hearts. It is in this area where your words and gestures take on monumentally exaggerated qualities. A word or deed here can and will make or break the entire pas d'armes for a Lord. By all means, test those who seem willing, challenge that rapier wit when you see it, and cast down arrogance; but raise up temerity, and there you may find wisdom. Compassion is its own reward. Please send me your comments or discussion on this topic! Certainly there are other views than mine, so lets hear and discuss them. This is not meant to be a rulebook on behavior, but a thought-provoking guide.